*View from the RAX Cam 2 (Rear Axle Cam #2)* Looking at the back-side of the rear axle, the view from left to right is as follows: Left wheel/backing plate, left leaf springs, axle tube and rear shock, back-side of rear differential, shock reservoir hose (passing in front of aux. fuel tank), and just below the shock reservoir itself, you can see a bit of the right rear tire. This black and white camera is really fun for watching the rear suspension cycle, and could be useful in troubleshooting axle-wrap. 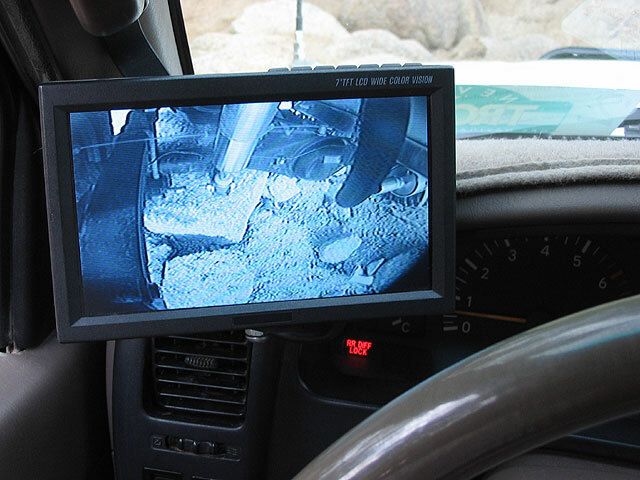 It can also be helpful if you have dropped off or gone over some large rocks, and need to back up to reposition the truck. You can see what you are about to hit with the backside of the axle and differential. Are you hanging up on the diff, the shock mount, or your u-bolts? Now you can be the judge.